One of the ways you can make your presentation look more interesting is to add a background to your slides. We’ve already seen how we can apply a gradient background, so now let’s have a look at using a picture fill background in PowerPoint 2013. First of all right click on a blank area of a slide and select Format Background. The Format Background panel will open up to the right of the workspace. Select Picture or texture fill and some new options will be displayed. Picture fill – you choose a picture to display in the background. The picture is either on your computer, or online. 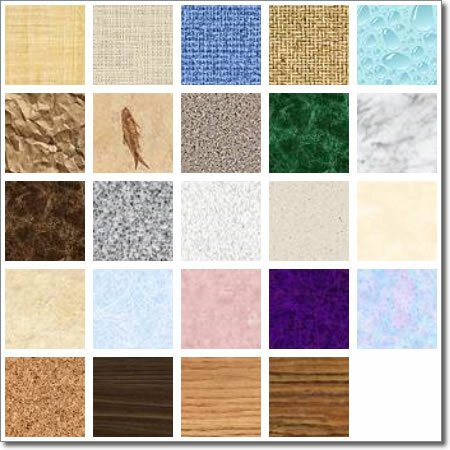 Texture fill – there is a small selection of textures that come with PowerPoint 2013. They look like pictures, but they can repeat seamlessly in the background. If you decide to use a picture fill for your background, click on the File button and navigate to where your picture is on your computer’s hard drive. Select it and then click Open. The picture will appear as a background to the currently selected slide. If you want it to appear on every slide, click the Apply to All button at the bottom. Alternatively, if the picture you want to use is online and not on your computer, click the Online button. If you are not signed in, however, you won’t see the SkyDrive, Facebook and Flickr options. Use one of the search engines to find a suitable image and, once found, select it and then click Insert. The image will be downloaded and then appear as your currently selected slide’s background. If at any time you mess up, you can always click Reset Background to return the background to how it was before the “mess up”. Transparency – drag the slider right to increase transparency and to the left to decrease it. Transparency is simply how “see through” the picture is. Tile picture as texture – if you want the picture to repeat as many times as it takes to cover the background, check this box. If uncheckd, the picture will expand to fill the whole background. Offset left/right/top/bottom – increasing the offset values makes the edge of the image move further away from the edge of the slide. For example, if you wanted a margin of whitespace around your picture, you could put a value of 5 in all the offset values and then there would be a 5% margin all the way around the picture. Textures are images really, but they tile seamlessly. When you select a texture, the Tile picture as texture box is automatically checked, and you can see the texture repeating perfectly. The same offset values that were seen for pictures are available to modify. Alignment – use this option to tell PowerPoint where the texture starts and tiles from: top left, top etc. Mirror type – this option ensures that the background is symmetrical about the axis you choose: vertical or horizontal. If you have an image that you know will tile seamlessly like textures do, you could always insert it as a picture and then check the Tile picture as texture box. In PowerPoint 2010 you could get to the Format Background options by clicking Design (tab) > Background (group) > Background Styles, and then selecting the Format Background Option. You could also right click on any slide and select Format Background. PowerPoint 2013, however, has a brand new Format Background panel. If you click the design tab, then click the Format Background command (in the Customize group)…. … then the Format Background panel will open up on the right of the workspace. 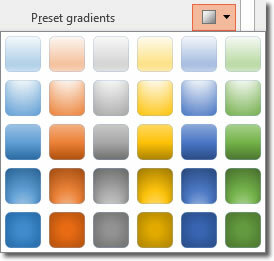 This panel provides all the functions previously available in PowerPoint 2010. You could also get here by right clicking on a slide and then selecting Format Background. To close the panel down, just click on the X in the top right corner. solid fill – the background has a solid colour, like red or blue. gradient fill – the background makes a smooth transition from one colour to another colour. You can choose different types of gradient, like radial or rectangular, and choose the colours you want to appear in the gradient. Learn more about how to apply a gradient fill background. 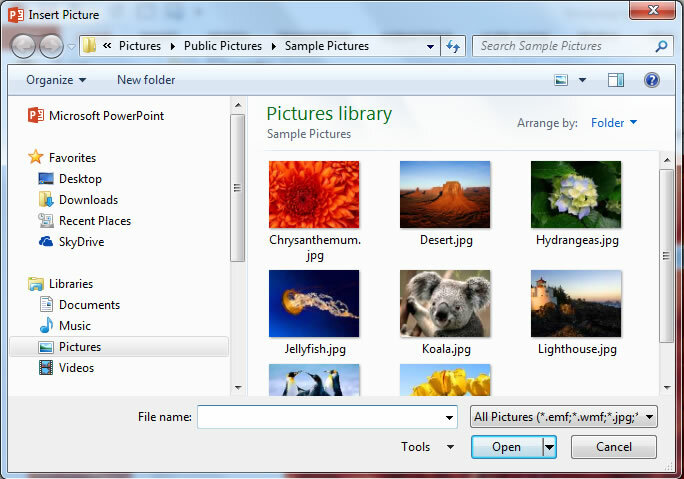 picture or texture fill – you can have a picture background appearing on every slide. pattern fill– choose from a selection of preset pattern fills to appear as a background. There are a couple of extra options at the bottom of this panel. The Apply To All button will apply your current background formatting options to all slides in your presentation (as opposed to the currently selected slide), whereas the Reset Background will remove all formatting from your background and will reset it to a solid fill of white.